Most dance forms look for “line”, that curvilinear continuity through the body that can be so aesthetically pleasing to the viewer and create the illusion of great length from fingertips to toes. One particular line that is difficult to train for but still desired is that of the foot and what makes up our “pointe”. The overall shape of our pointe comes mainly from two curves: the one from the shin to the top of the foot, and the one under the sole of the foot. There is certainly mathematical beauty in the ratio of these two curves. With great advice from Dr. Carrie Skony, a Chiropractic Sports Physician who specializes in treating dancers, we’ve put together some useful information you can use to safely strengthen and improve your arches and your pointe. Our feet are made up of many small irregularly-shaped and long bones that fit together snugly and are held together by strong ligaments that allow for some movement between the bones. It’s important that the foot naturally allows some movement between the bones so that you can do things like adapt to different terrains, but you don’t want to have so much movement that your foot is being pulled in different directions when you put a lot of forces on it. And we do put a lot of forces on it! Just walking results in ankle joint compression forces up to five times bodyweight, and up to 13 times bodyweight when we run. You can see then that it’s critical for the ligaments to stay very strong to hold the bones together. 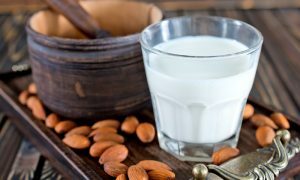 What we have with bones and ligaments are called passive structures – they can’t contract and can’t stretch and return to their original shape like muscles and other soft tissues can. Ligaments can naturally stretch a little bit, but they aren’t very elastic, so if they get overstretched they can stay over-stretched and even tear. We definitely want to stretch our feet in a way that stretches muscles, but in pursuit of a better pointe we also run the risk of overstretching ligaments! Because of this, we need to avoid doing too much to stretch out the top of the foot. Avoid doing things that press really hard on the top of the foot and force the foot and ankle into an extreme position. Examples include putting your feet under something heavy like the edge of your couch and using devices made for stretching the foot that have a stiff or solid upper. You need to be careful with those devices even if they have a soft or stretchy upper and be sure to use them safely. This means not just putting your foot in it and sitting there in the stretch; it means using it more like a resistance band to actively push against the resistance to strengthen your muscles through that full range of motion. Instead of traditional stretching, using balls of various sizes and stiffness can also help you use massage and pressure to stretch out various parts of the foot and lower leg. As with any stretch, you should already be warm, only go to the point of tension and not to pain, make sure you are maintaining proper alignment (no rolling-in and no sickling), and make sure you are not crunching your joints like the back of your ankle. 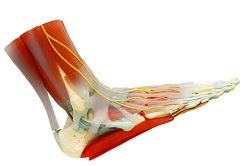 Side view of human right foot muscles anatomy model isolated on white, clipping path. The safest and most functional way to improve your arches is to do it through strength! 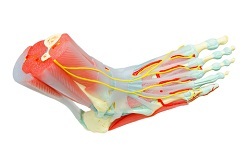 Muscles that control foot movement are located both inside the foot, which are intrinsic to the foot, and in the lower leg, which are called extrinsic. The extrinsic muscles control ankle movement including flexing the foot up (dorsiflexion) and pointing the foot down (plantar flexion) in addition to extending the toes up and flexing them down. That’s right – muscles in your lower leg contribute to pointing your toes! The intrinsic muscles help keep the bones of the foot together and also contribute to contracting the sole of the foot while pointing. Strengthening these muscles will improve the look of your arch and the stability of your foot and ankle, a bonus that is incredibly important for both artistic performance and injury prevention. Dr. Skony recommends a slew of different exercises that strengthen and shape the foot. Short foot exercise: Keep the ball of the foot in contact with the floor and the toes long while lifting the arch using the muscles in the midfoot. Try not to grip on the top of the foot or ankle. Learn this exercise in a seated position. Once you improve, you can progress to a parallel standing position, then turned-out position, and finally a single leg stance. You can also do it while in plie, and also trying to feel the same muscles working when pointing their foot off the ground, as in moving into a tendu or when the foot is en l’air. 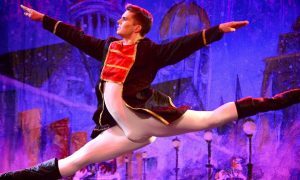 “For good intrinsic foot control, it’s imperative that a dancer can perform short foot exercise well,” Dr. Skony says. Piano toes: Perform a short foot exercise but with toes lifted (extended), then slowly lower the toes to the ground one by one as if playing a piano, trying to use each toe separately. Do this going in both directions. Try it seated and standing. Toe spreading: Separate the toes apart from each other and away from the midline of the foot, without flexing or extending the toes. “This can help prevent drifting of the big toe inward as we see in bunion formation,” Dr. Skony explains. Shimmy squat: Stand in parallel with both feet in short foot position and toes lifted off the ground, and plie into a comfortable squat position (keep knees over toes). While maintaining contact on the floor through the balls of the feet and the heels, shimmy your feet forward one at a time to shuffle forward across the room, maintaining arch height the entire time. Dr. Skony does not recommend scrunching a towel with your toes because it promotes overuse of the flexors, and she suggests using a resistance band with the ankle pointed into its full range first so that you’re moving the toes independently of the ankle. Just remember to keep the toes long and not curled under. There are other activities you can do for overall cross-training that are generally safe for dancers and will strengthen the foot. Some examples of this include: some styles of yoga where safely moving through various flows requires you to work on strength and endurance of the muscles that control the foot and ankle; running and/or walking in appropriate shoes and with good form; certain dance techniques such as pointe work, as it requires great strength even while in a stretched position; and Graham, as it requires a lot of floorwork that changes the shape and strength of the ankle and foot over time and practice. These can be used purely for exercise even if you’ll never do them on stage.